The International School of Nice is an essential part of the educational infrastructure on the Cote d'Azur. ISN provides an Anglophone programme for students aged 4 to 18 years (Pre-K to Grade 12). 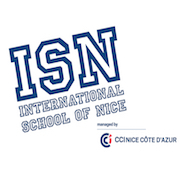 The International School of Nice is an IB World School, offering both the PYP and IBDP, and is fully accredited by two agencies - the European Council for International Schools (CIE), and the Middle States Association of the United States (MSA). The International School of Nice is a clear reflection of the international community on the French Riviera with an enrolment composed of over 40 nationalities. There are a large number of extra-curricular activities for students, including sports tournaments, Model United Nations, Student Council and Field Trips in France and abroad. ISN's graduates go on to pursue higher education at top universities all over the world. Description 172-175 teacher contact days. Teachers are not required to be present during school and national holidays (Autumn, Winter, Spring and Summer breaks, Armistice etc.) which generally follow the French academic and national calendar. Description Teacher salaries range from €30020 to €42800. The system of remuneration is based on the amount of experience in education and qualifications and is calculated on a 21 step scale. Each step corresponds to one year of teaching experience. Teachers with a masters or doctorate are awarded an additional step. Promotion from one step to the next is effective in September. Description Too much. It's France! Description Supplemental retirement plan to top-up social security payments for retirement. Description One-way economy airfare from contractual point of origin by the most direct route to Nice. Description Relocation assistance: practical and financial assistance towards certain relocation expenses (up to €800 on the invoice). Shipping expenses reimbursed up to €1500 against receipts. Description Free tuition for children of ISN teachers with a full teaching workload. Description Comprehensive medical cover for short and long-term illness. Description Comprehensive Insurance cover in case of death or disability. Description Comprehensive staff appraisal and development programme to ensure that ISN is providing a dynamic educational experience that empowers and challenges our community of learners to unlock their full potential in a world of change.